Schoenstein & Co. held an Open House celebrating the completion of two new organs for Fordham University in New York City. The event drew an estimated 200 visitors including 21 members of the Schoenstein family representing the fourth, fifth and sixth generations. 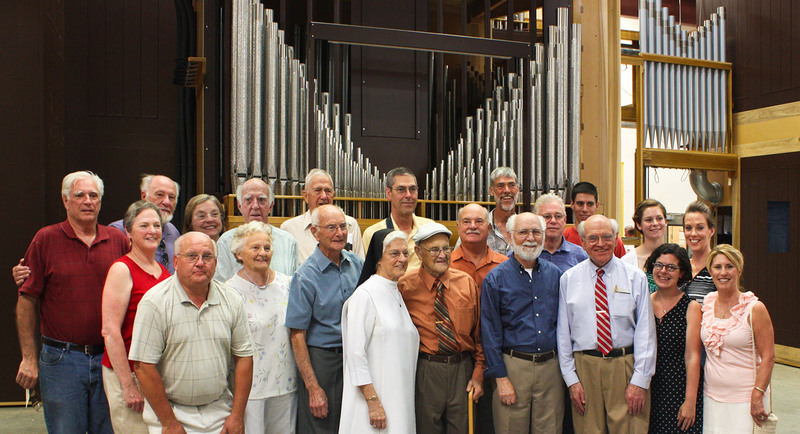 The group included the eldest Schoenstein organ builder, Bertram age 95, shown front center with company president Jack Bethards (third from right) and 20 Schoensteins including six of Bert’s siblings and cousins. Fordham is a leading Roman Catholic university and the event was of special interest to members of the family, two of whom are members of Roman Catholic religious orders. The two organs are destined for the renovated University Church on the Rose Hill campus in the Bronx. The two-manual, 14-rank organ will be in the Sanctuary, the three-manual, 35-rank instrument will be in the Gallery. Both are encased and free-standing. Grandchildren of company founder Felix F. Schoenstein: Sister Mary Mark, Norman, Vincent and Edward with company president Jack Bethards.